The “Pilot Project on Channeling Remittances for Enterprise Development in Masbate, Antique, and Agusan del Sur” will be implemented by the Small Enterprises Research and Development Foundation (SERDEF) and the UP Institute for Small-Scale Industries (UP ISSI) starting this month, September, until June 2012, under the Joint Programme on Alternatives to Migration: Decent Jobs for the Filipino Youth, of the International Organization for Migration (IOM). The contract for the implementation of the project was signed this afternoon, September 23, by Ovais Armad, Director, Manila Administrative Center and Chief Of Mission, IOM Philippines and Paterno V. Viloria, President of SERDEF at the IOM Philippine Office in Makati City. Witnessing the signing were IOM’s Ricardo Casco, Sandra Panopio and Marilou Sese, UP ISSI Director Nestor Raneses and SERDEF’s Serenidad Lavador, Gloria Canela, and Myrna Co.
After the signing, Director Armad underscored the multi-faceted nature of the migration phenomenon , which calls for the commitment of many sectors and agencies. He expressed appreciation for the collaboration with SERDEF towards the goal of enhancing the positive impact of migration in alleviating poverty and fostering development. The pilot project will roll out pilot schemes in channelling OFW remittances into productive small and medium enterprises to be put up in the target provinces. More specifically, viable agri-businesses would be established through market-oriented interventions to trigger socio-economic growth in the pilot areas. 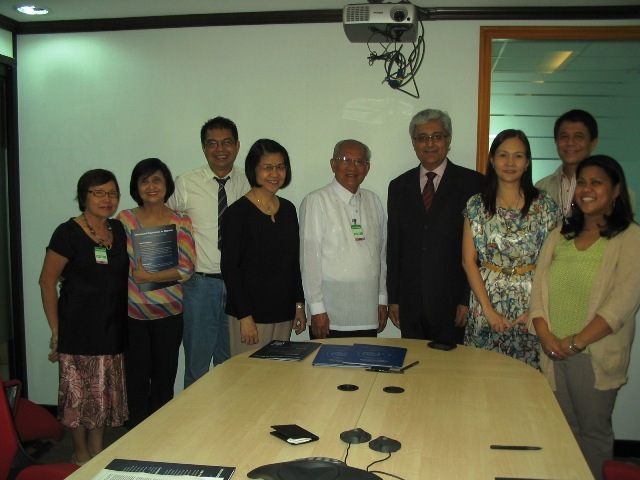 The project proceeds from an earlier research study, likewise conducted by the SERDEF for IOM, which confirmed that benefits from OFW remittances will be sustained through creating mechanisms that could induce the migrants and their families to allot a portion of remittances to business investments. The study identified four industry sectors to support using the value chain approach: muscovado, rubber/abaca (including intercropping), rice and livestock industries. It is envisioned that the OFWs and their families will be involved in the pilot projects not only as sources of investment capital but also as entrepreneurs, managers, marketing agents, or mentors. The pilot projects would be implemented with the support of other stake holders, including local government units, banks and micro-finance institutions, agricultural cooperatives, local civil society, industry associations, and small enterprise support agencies. The pilot projects, when proven successful, may be later replicated in other parts of the country to generate the multiplier effect in harnessing OFW money to beget more wealth. Congatulation on this contract signing and more power to your causes.